Note: Variable duration rings. Use bells, buzzers, or a mix of both. Scheduled event program rings bells, controlling crowds of workers. Automatically backs up every-day, you schedule it. 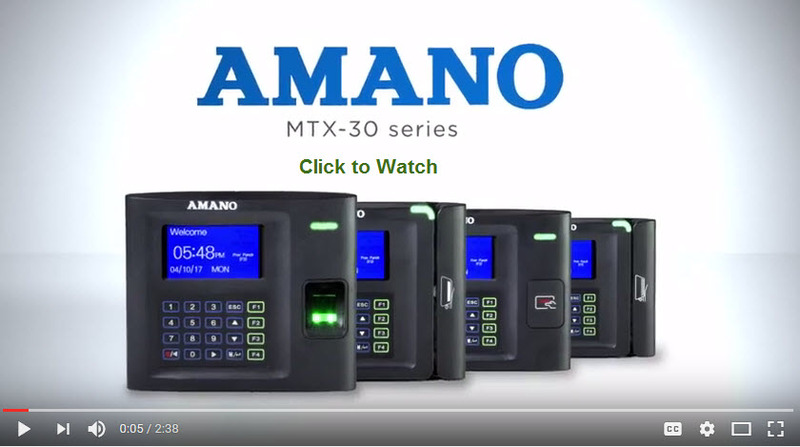 MTX-30 proximity time card time clock. Everything is labled to make this easy for you to follow. and on the days that you want. Hardware: The Proximity reader has a capacity of 2000 employees per machine. 2000 employees But when you get above 75 people, you start to have lines. Employees can be assigned to multiple clock terminals. 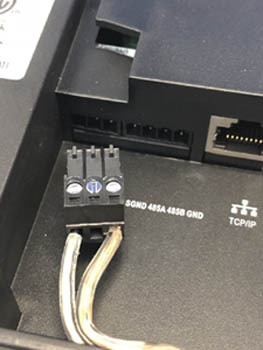 All TimeGuardian systems come with two managers, aka two "system administrators." When you upgrade to 5 (the first upgrade, which is a TOTAL of 5) users/administrators, you get the ability to assign unique usernames and passwords to the manager, and also assign what they can - and cannot - do. For example, you would not want the Parts Manager to have the ability to change the punches for people in the Administrative department, or to change the pay cycle. But you might want him to be able to correct punches for employees in the Parts department. On the other hand, the payroll manager would have access to everything., and the company owner might only have access to making and reading reports. TimeGuardian starts with 100 employees. If you purchase + 25 employees, you then have a license for 125 ACTIVE employees. If you purchase a 250 employee upgrade, you then have a license for 350 ACTIVE employees. Employees can be inactivated and brought back, next season. HOW MANY TIME CLOCKS DO I NEED, - AND WHY? If you have over 75 employees, it's time to add a second time clock. If a clock goes down, you can always have them use the other one until it's repaired or replaced. You also save money by not having people stand in lines to punch in and out. 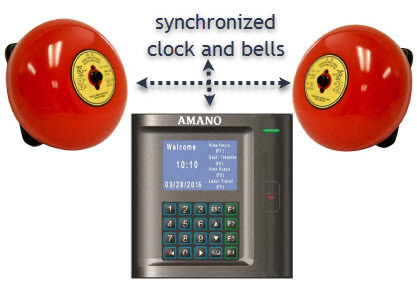 Amano Time Guardian is an employee time tracking system designed to minimize payroll management. 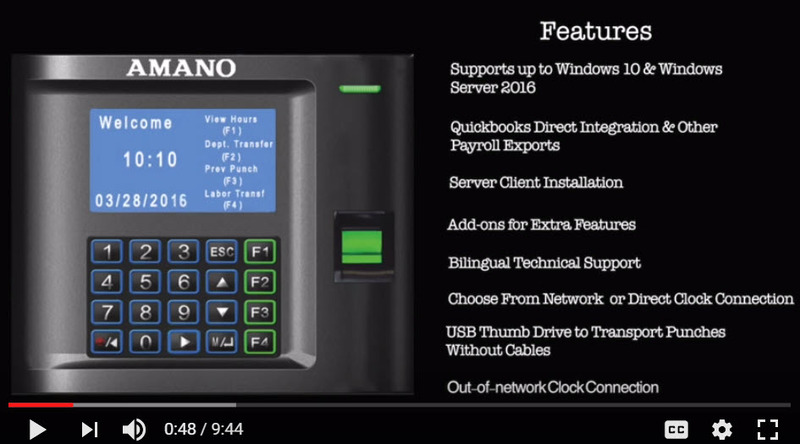 This economical time clock system interfaces with most common payroll applications, including ADP, Paychex, QuickBooks, and .csv. This provides a complete turn-key solution to accurately and effectively mange your payroll. It enables you to automate the collection, calculation, and preparation of employee time records, while increasing your profits. 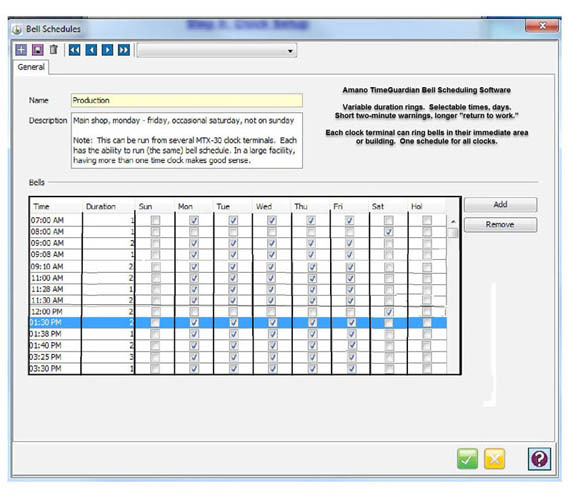 Scheduling - basic scheduling software- keep better tabs on your employees lunches, start and finish times.